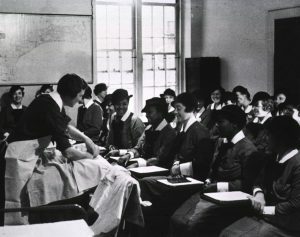 Nurses training program class of white and African American nurses, National Library of Medicine Collections. NNLM NER is focusing on work done by New England hospital librarians in support of nursing education and research. Our first interview was with Mary Shah, MLS, AHIP. She is a Medical Librarian and Archivist at Danbury Hospital in Connecticut. 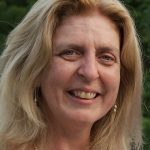 The second interview was with Maureen Dunn, MLIS, AHIP, Library Director at Concord Hospital in New Hampshire. Last month, Lisa Liang Philpotts, BSN, MSLS, Knowledge Specialist for Research and Instruction at MGH’s Treadwell Library, provided answers for our third interview. Our wrap-up for this series features Donna Belcinski, Coordinator of Library Services at Greenwich Hospital in Connecticut. Tell us how your library supports nursing education and/or research. The Greenwich Hospital Medical Library uses many of its resources to support the nurses’ efforts to further their education and conduct research. We have developed a collection of nursing textbooks, certification manuals, drug and procedure guides, and other books our nurses find useful for both their studies and their practice. We also give instruction in database searching, and co-teach the EBP I and EBP Mentor classes that demonstrate how to conduct research. We also have a small collection of books and resources that specifically relate to the Magnet program. Our hospital received its Magnet designation in 2016, and the library was cited by the Magnet surveyors for its contribution to the effort. What resources, services and programs are most popular with nurses? New nurses appreciate the library orientation, as most are amazed at the services we offer and the scope of our collection. Any of the nurses going to school love the fact that we will do literature searches for them. Our nurses work hard, and most have families, so finding the time to do their own searches isn’t always possible. How do you align this work with the mission of patient safety and healthcare quality? Nurses do better work when they have the latest EBP resources at their fingertips. We source those products and provide them through both the library website and our EHR. Our nurses have the most up to date patient care information available, so our patients get the best quality healthcare. We also have a patient safety resource collection, as well as a libguide devoted to safety and quality. Any tips for librarians interested in supporting nurses? I would reach out to the Education department, and the Nursing Research committee if your hospital has one. Both of those here at GH are happy to have the library involved and value our contribution. If nurse leaders meet regularly, ask to get on the meeting agenda to talk about the services you can provide. If nurses are too busy to come to you, ask to schedule some time during departmental huddles to talk about the library. If you let them know how much help you can provide, the nurses will definitely seek you out. The Magnet Recognition Program designates organizations worldwide where nursing leaders successfully align their nursing strategic goals to improve the organization’s patient outcomes. The Magnet Recognition Program provides a roadmap to nursing excellence, which benefits the whole of an organization. To nurses, Magnet Recognition means education and development through every career stage, which leads to greater autonomy at the bedside. To patients, it means the very best care, delivered by nurses who are supported to be the very best that they can be. Stimpfel AW, Rosen JE, McHugh MD. Understanding the Role of the Professional Practice Environment on Quality of Care in Magnet® and Non-Magnet Hospitals. J Nurs Adm. 2015 Oct;45(10 Suppl):S52-8. doi: 10.1097/NNA.0000000000000253. PubMed PMID: 26426138; PubMed Central PMCID: PMC5619653. Donna Belcinski provided the link to the Greenwich Hospital LibGuide on their Magnet Journey.